So autumn has started already and I know it is the most favourite season of the year for so many people. I love autumn, but truth to be told, I’m not a big fan of colder, rainier and darker days, so I decided to write my autumn family fun list aka autumn bucket list so I have something to look forward to and enjoy! – Go for autumnal walks. We will need to wrap up warm! -Take lots of autumn photos. Autumn is such a colourful season that taking photos at this time of year is really fun. I just hope for some sun too! -Visit a new country park. There are so many country parks around us, so I’m really looking forward to visit a new one, especially for the woodland walks. We will perhaps visit Beecraigs Country Park or Mugdock Country park as we never been there before. 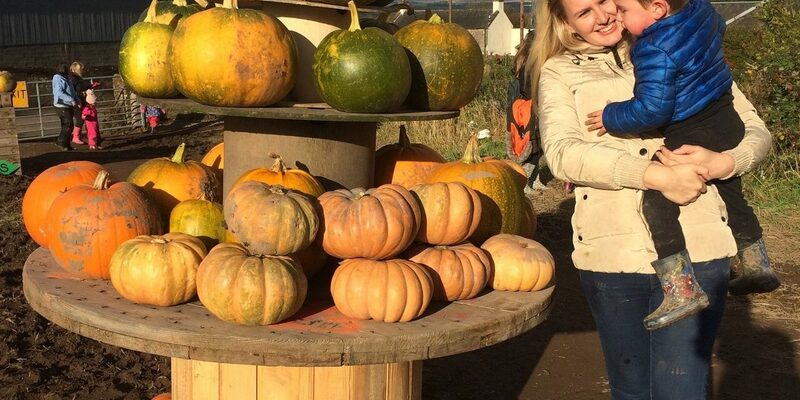 -Visit a pumpkin patch. Last year me and my then 2 year old son went to our local Arnprior farm. 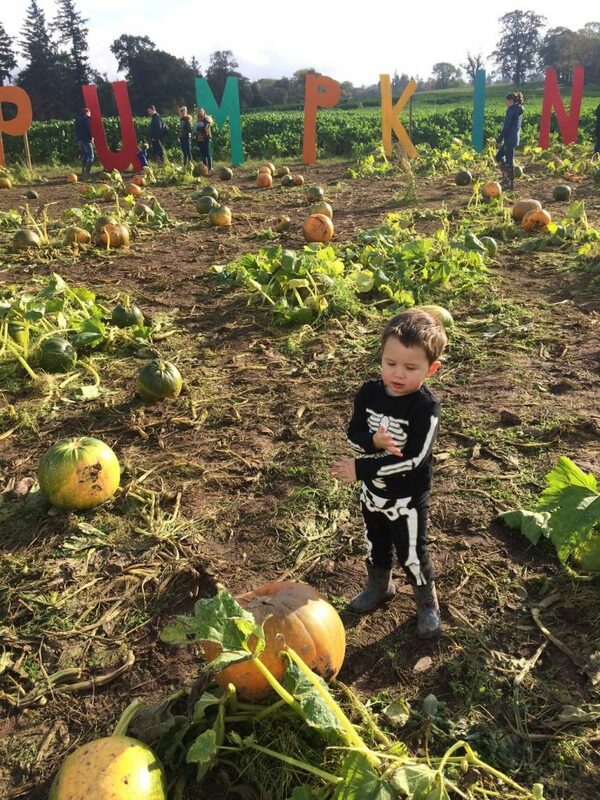 We had so much fun then and are looking forward to visit their pumpkin patch this year again. – Carve a pumpkin. I’m not an arty crafty person but I enjoy this Halloween activity and I’m hoping this year my pumpkins will look a bit better than last year! – Halloween play date (or even a party). I am hoping to gather a few Oscar’s little friends (and their mums) and have a little Halloween party at home. – Dress little ones in Halloween costumes. That goes without saying and this year I have 2 children to dress up! Fun times! – Go to the beach. Yes, it’s not your typical autumn activity, but I really fancy a walk at the beach as I haven’t done that for a while due to being pregnant and having a newborn. I’m thinking about Crammond beach near Edinburgh. – Visit a castle. There are so many beautiful castles in Scotland. I would love to go to Glamis castle next time we have a family day out. – Collect autumn ‘treasures’ – colourful leaves, conkers, pine cones, acorns and sticks! This was one of my favourite things to do in autumn when I was a child. – Cook homemade vegetable soups. Most likely it will be a pumpkin soup. – Bake an apple pie. Haven’t baked for a while so I’m looking forward to this. – Get books from library about autumn. I love seeing Oscar learning about seasons. Currently we read Peppa’s Pumpkin Party book at his bedtime. – Buy a new blanket/throw for living room. Looking forward to snuggle under it on cold autumn evenings. – Buy an autumn/winter coat, big scarf and fluffy jumpers. Great excuse for a shopping trip! I’m aiming to create a capsule wardrobe though! -Bonfire night. We didn’t really enjoy it last year. I think my kids are still a bit too young, maybe in another couple of years. -Drink a pumpkin spiced latte. I know so many people are excited about it, but for me, it’s just a bit too sweet! I’ve got MUCH more on my to do list, but some of the things are a bit boring or too personal to share! Have you got some plans for autumn? Great list! I tried my first pumpkin spiced latte last week (was on my bucket list to try one) and I agree with you it was very sweet. My sister introduced me to the maple latte by Starbucks which I think will be my go-to Autumn coffee! I love autumn for all these reasons too. My kids love collecting autumn treasures and I love making soup as well as lots of outdoor exploring. We need to visit a pumpkin patch but never seem to get round to it! Love this, hope writing it down helps you achieve your goals. Beecraigs has a brilliant playpark, we go quite a bit. I really need to find a pumpkin patch this year, thank you for the reminder! Great list of goals! I may even set some of my own. I haven’t baked and apple pie in ages so going to do that j think over next few weeks. I’m dying for a pumpkin spice latte though – mainly because I haven’t had one in years. I’ve heard that Arnprior is really good but it’s over a 2hr drive down there so a bit far to go. I love soups, stews, etc at this time of year. My slow cooker goes into overdrive 😂. You have loads of ideas for your bucket list.